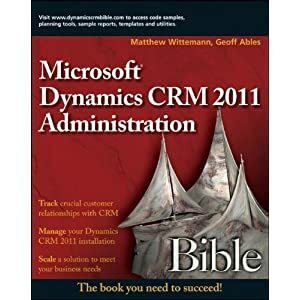 I've got to admit that when I first heard about Jim and Darren's book on the new features in CRM 2011, I anticipated that the book might be 50 or 75 pages - after all, in my book, the Dynamics CRM 2011 Bible, I only dedicated about 10 pages to covering the new features that distinguish CRM 2011 from the previous version, CRM 4.0. So I was surprised and curious when I discovered that the book is actually 288 pages in total. The book is available from Packt Publishing, and is actually includes in-depth information that goes well beyond describing the new features of CRM 2011 as it goes into some detail on how to take advantage of the new features in the platform. It walks the reader through an "XRM" scenario (where "X" can stand for anything, not just "Customer" relationship management). A better title might have been "Exploring the New Features of CRM 2011." But I won't quibble with titles. Starting with the first chapter, the reader is guided through setting up a development environment so he or she can follow the authors through the process of building out their sample XRM scenario, an "Airline Compensation Management" (ACM) solution. This is a great example of how the CRM platform has evolved well beyond traditional Customer Relationship Management, and can provide a foundation for a wide variety of business applications. Chapter 1 (Setting up the Development Workspace) covers the tools and software you'll need to have in place to practice what you learn in the book. Chapters 2 & 3 guide you through the initial configuration and setting up some sample data. Chapters 4 through 9 cover programming the ACM solution (client-side and server-side), integrating with SharePoint, layering on some BI with charts and dashboards, and even implementing an integrated portal in Azure. The final chapter helps the reader understand the solution framework and how to use solutions for transporting your customizations between environments. I found the book easy to follow and clearly written. Jim and Darren do a great job of sharing some of the insider tips they've learned through years of experience with CRM and calling the reader's attention to important tips and idiosyncracies of working with CRM 2011. There are many helpful screenshots and illustrations along the way. In particular, I found Chapters 5 & 9 to have some great content for developers who are familiarizing themselves with CRM 2011. Chapter 5 has a nice diagram that explains the mechanics of plugins and a useful introduction to the concept of plugin development. Chapter 9's walkthrough of adding buttons to the ribbon, which includes sample code, should be a big help to everyone who has fought the valiant fight with the CRM 2011 ribbon! All in all, Jim and Darren have done a great job in packing a lot of content into this book and showing a nice real-world example for building a solution on top of CRM 2011. You definitely get a good understanding of the new features in CRM 2011, but you also will learn how to start using them for your own business applications! I recently joined ClickDimensions as the Chief Customer Officer, and have started blogging there. 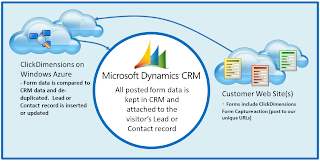 The blog includes a ton of great CRM-related tips and articles, especially about marketing with Dynamics CRM. If you're interested in email marketing, marketing automation, and getting ROI out of your Dynamics CRM system, check out their product tour. I'll be presenting a session for CRM administrators at the upcoming Decisions Spring 2011 virtual conference on June 17, hosted by MSDynamicsWorld.com: What CRM Administrators Need to Know About CRM 2011. I'll cover the most important technical considerations that administrators need to be familiar with when considering implementing or upgrading to CRM 2011. MSDynamicsWorld.com has been hosting these semiannual events for a couple of years now, and they are tremendous, free resources for learning and networking. The conference kicks off on Tuesday, June 14, with sessions dedicated to Dynamics AX. The 15th is focused on GP, the 16th on NAV, and the 17th on CRM. You'll have the opportunity to ask questions of the presenters via live chat, and interact with other attendees and experts in a virtual networking lounge. 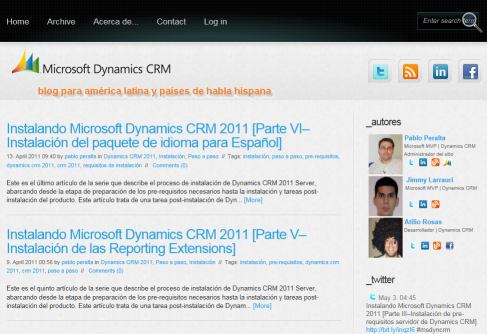 Mi amigo Pablo Peralta ha colaborado con compañeros Jimmy Larrauri (también un MVP) y desarrollador Atilio Rosas para poner en marcha un nuevo blog en español acerca de Microsoft Dynamics CRM. El blog se puede leer en http://www.elblogdedynamicscrm.com. Es genial ver a la creciente comunidad internacional de usuarios de CRM en los países de habla española, y este nuevo blog debe ser de gran ayuda para ellos. Marketing Pro? You need to read this! I've been working in the Microsoft Dynamics CRM industry for, oh, seven years now. Since Microsoft first released the product. The first implementation of CRM that I did for a customer was with version 1.2 way back in 2004. In very short order, my customer and I found that there were, shall we say, gaps in the product's functionality. Back in those early days the options for filling these gaps were pretty limited. There was one fellow that was doing some pretty smart work, and whose company's products made my life as a systems integrator that much easier. 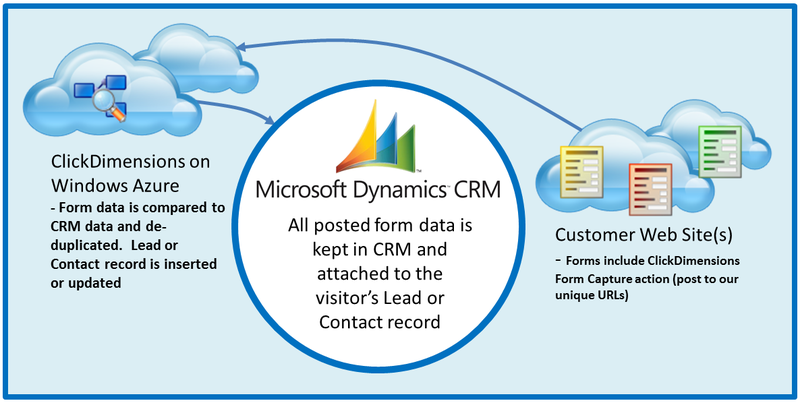 Fast forward to 2011, and the Microsoft CRM ecosystem has matured along with the product itself. But that same gentleman is still offering solutions that make my life easier - and making the CRM projects I work on able to deliver that much more value to my clients. That person would be John Gravely, who last year started a new company called ClickDimensions. ClickDimensions is a great example of a cloud-based, seamlessly integrated solution that delivers real value to CRM marketers. If you're familiar with Google Analytics, imagine having that data driven directly into your CRM system and tied to existing leads or contacts. And wouldn't it be great if you could generate rich, HTML emails for CRM marketing campaigns? Imagine being able to see when someone clicked on an email you sent, visited your site and spent some time reading a few pages - right inside CRM. Want to know if your social media campaign is paying dividends? What about if it's the right time to call an important prospect? Or if several of your competitors are lurking on your website? Would that be valuable to you as a professional marketer? Full disclosure: I need to point out that my company, C5 Insight, is a reseller partner for ClickDimensions - but we wouldn't be reselling their solution if we didn't believe in its value and power.